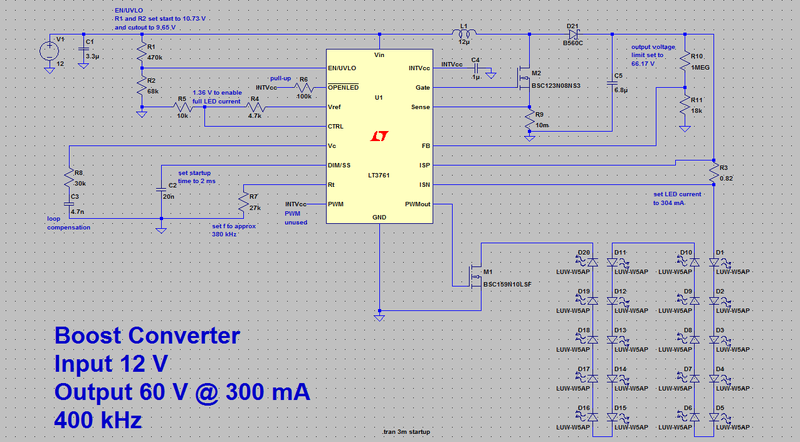 Continuing on from my recent post on designing a DC-DC converter for an LED panel, I've done a preliminary simulation of a boost converter using the Linear Technologies LT3761 to investigate some of this issues that need to be considered. You can download the LTSpice file for this project from the Github repository. This simulation is mainly to see if this kind of topology is feasible. It allows me to choose components, see how much current they'll draw, and how much power they'll dissipate, if there's anything obviously wrong, I can make adjusts before I get too far down the track. In the simulation below I haven't taken advantage of the features that allow the output current to be varied. I wanted to keep it simple to start with. The circuit is essentially a reference design from the datasheet that's been adapted for my specifications. To simulate the LED panel, 20 LEDs have been connected in series. It was previously verified in a different simulation that this arrangement of LEDs has a similar voltage-current curve to the panel I am trying to drive. The converter seems to be doing its job, the current is around 300 mA and the voltage is around 60 V. I'm concerned about the overshoot at start up, but it only lasts for around 400 us, which should be OK. It's possible that I may be able to get better results by adjusting the compensation components connected to Vc, or changing the startup time capacitor on DIM/SS. I'm also concerned about the specifications for the inductor. I need to make sure that the peak current is less than the saturation current. I haven't looked into this yet. If there's a problem it may mean I have to change topology or the operating frequency. I took the opportunity to take some power measurements from the simulation as well. The converter averages 18.718 W input while delivering 17.868 W to the load making it 95.4 % efficient. Some other power readings are as follows. The numbers don't add up correctly (due to rounding and numerical simulations), but they at least give a ball park estimate of the power dissipation of components. I know it's SPICE and the real world doesn't match the simulations, but I'd like to spend a little bit more time tweaking the design in SOFTWARE before I commit to anything. That's a job for the coming week.